Synthetic peptide within Human Pax2 aa 1-100. The exact sequence is proprietary. Our Abpromise guarantee covers the use of ab79389 in the following tested applications. WB 1/1000 - 1/10000. 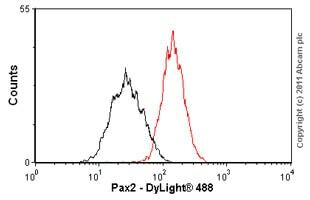 Detects a band of approximately 45 kDa (predicted molecular weight: 45 kDa).Can be blocked with Pax2 peptide (ab188213). 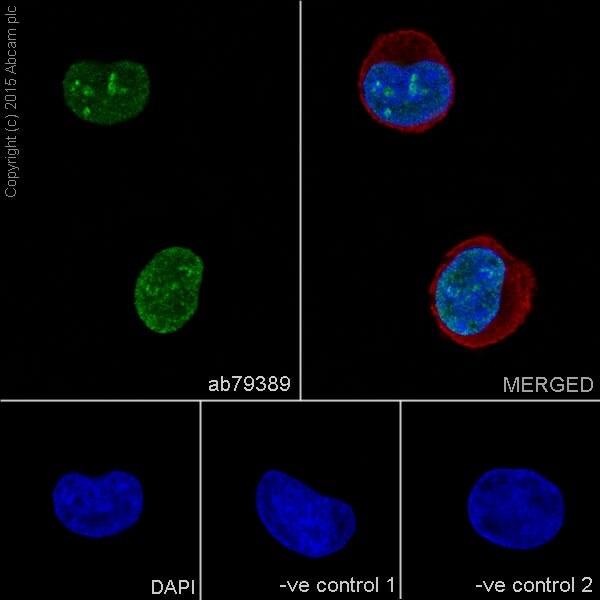 Immunocytochemistry/ Immunofluorescence - Anti-Pax2 antibody [EP3251] (ab79389)Lee SB et al. PAX2 regulates ADAM10 expression and mediates anchorage-independent cell growth of melanoma cells. PLoS One 6:e22312 (2011). Immunohistochemistry (Formalin/PFA-fixed paraffin-embedded sections) - Anti-Pax2 antibody [EP3251] (ab79389)Lee SB et al. PAX2 regulates ADAM10 expression and mediates anchorage-independent cell growth of melanoma cells. PLoS One 6:e22312 (2011). All specimens were fixed in 4% formaline (pH 7.4), embedded in paraffin followed by cutting with a microtome (3 µm thickness). The slides were deparaffinized in xylol for 20 minutes and then rehydrated in descending series of ethanol (100%, 100%, 96%, 96%, 70%, and 70%). For antigen retrieval the slides were boiled in citrate buffer (pH 6.0) for 40 min, and then allowed to cool down for 15 min. After washing with PBS buffer the endogenous peroxidase was blocked with H2O2 for 15 min at room temperature. After washing in PBS the slides were incubated with the antibody against PAX2 (dilution 1∶100) for 60 min at room temperature and washed in PBS again. 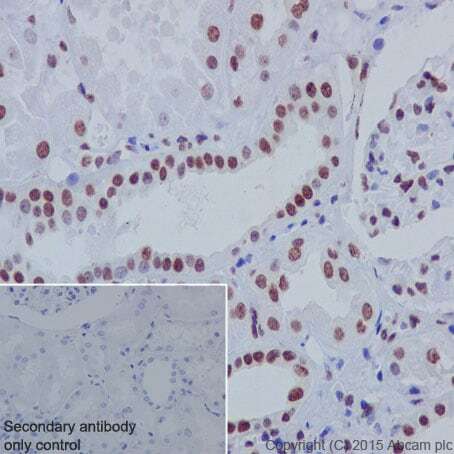 Immunohistochemistry (Formalin/PFA-fixed paraffin-embedded sections) - Anti-Pax2 antibody [EP3251] (ab79389)Image from Lee SB et al., PLoS One. 2011;6(8):e22312. Epub 2011 Aug 18. 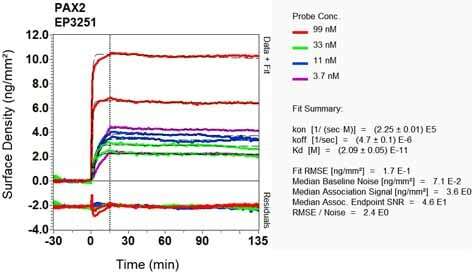 Fig 5.; doi:10.1371/journal.pone.0022312; August 18, 2011, PLoS ONE 6(8): e22312. 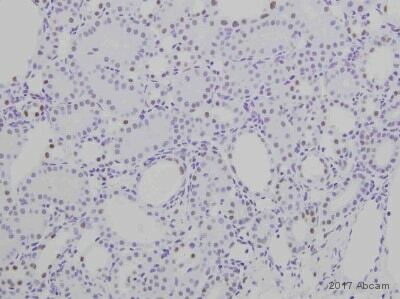 · Primary antibody (clone EP3251), 1:500, at room temperature (have tried 30 min and 60 min). Problem: we got positive reaction but it is very inconsistent. There are differences in intensity and distribution in the staining using exactly the same conditions from one slide batch to other slide batch, performed on different days. 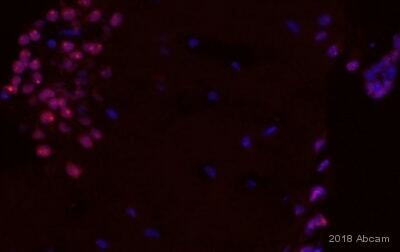 Again, we tried different antigen retrieval conditions, but the problem persists. 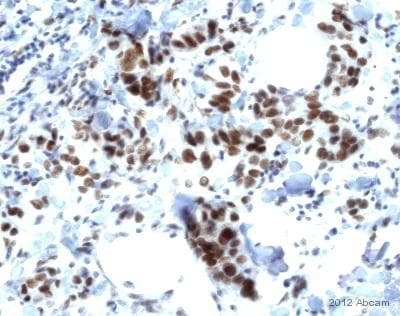 We don’t have this problem with other markers, and again, this is an IHC lab which runs hundreds of IHC per month. Please let me know if you are familiar with this problem with this antibody, and if you have any suggestion to improve the lack of consistency of this IHC. According to our records we have not received a customer report with similar results. You have tried quite a few optimizations, but the result is still not satisfying. Could you please let me know the species of your samples? 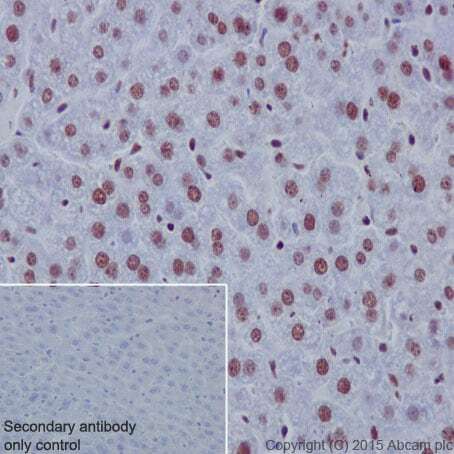 The antibody has been tested with human and mouse samples and we would guarantee it for these species. 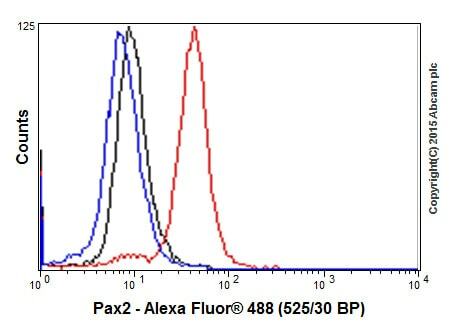 If you have used any of the tested species, I would suggest either trying another lot or a different Pax2 antibody. A credit or refund can also be issued. Please let me know your order or PO number in this regard as well as how you would like to proceed. instead , I did detect a band of about 15kDa. aware of (truncated, phosphorylated, ...? Blocking temperature : Room tem. I would like to reassure you that ab79389 is tested and covered by our 6 month guarantee for use in WB and mouse samples. In the event that a product is not functioning in the applications cited on the product data sheet, we will be pleased to provide a credit note or free of charge replacement. 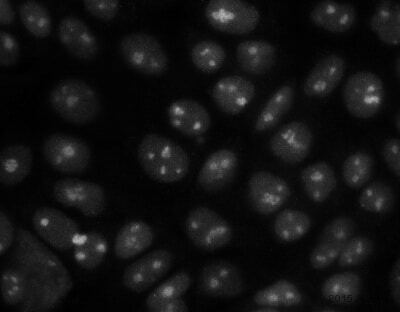 Pax2 is a nuclear protein and therefore I suggest to check if the RIPA buffer has enough SDS to lyse the nucleus. The SDS percentage might need to be optimised. To my knowledge the best expression of Pax2 is in fetal kidney and the expression level in adult kidneymight not be high enough to see the protein on a WB. I therefore recommend to use fetal kidney extract or to prepare a nuclear fraction in order to enrich nuclear protein when running a WB. When testing our antibodies, our lab uses 5% BSA as a blocking reagent, so I recommend switching to this instead of milk. Some antibodies give stronger, more specific signals on blots blocked with BSA instead of milk, so doing this may improve the results you are seeing, and reduce the non-specific bands. 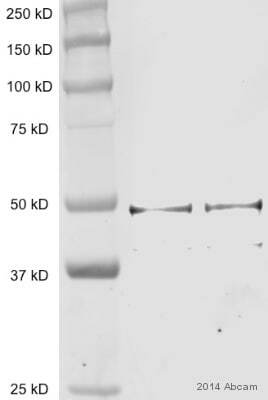 An example of the above is the western blot obtained with the Abcam GAPDH antibody ab9385 : https://www.abcam.com/ab9385 . I could not find any shorter isoforms than 42kDa, but according to genecards (http://www.genecards.org/cgi-bin/carddisp.pl?gene=PAX2&search=Pax2+) there are alternatively spliced variants which could be short enough to show up as ca 15kDa. I think this this results indicates no specific band is found and that when using fetal kidney samples this will be remedied. 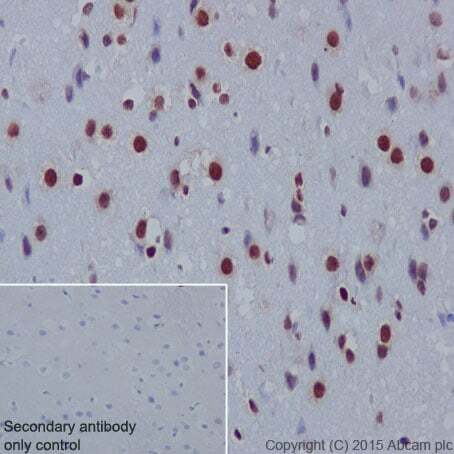 Please confirm that the correct secondary antibody was used. It should be an anti rabbit antibody from a species other than rabbit. is there any isoform of Pax2 in this molecular weight as you may be aware of (truncated, phosphorylated, ...? The concentration of your lot is 0.2290 mg/ml. In order to help you, I would need to know which lot./ batch number you received from us?